The RV Doctor: A Leaky RV Slideout... Really? 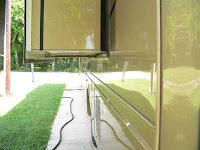 A Leaky RV Slideout... Really? Gary and Linda, sight unseen, this is a tough one! Slideouts remain inherently difficult to keep leak-proof forever. There has to be enough clearance for the room to slide in and out, yet gaskets and seals should be positioned to effectively wipe away moisture and keep water out whether the room is extended, retracted and all points in between. All slideouts are adjustable and it sounds like re-centering the room and adjusting the slide stops may be in order. As well as checking the integrity of the seals. Unfortunately, it will have to be looked at by a certified shop to be sure. It does not have to be a Monaco dealer by the way; just a good technician with slideout experience. If you don’t mind a short trip up to Willoughby, I can recommend a shop up there. Sorry I can’t offer much else without actually taking a look and taking a few measurements. Let me know in Hershey this year how it works out for you.